DBMM - a couple of games using the new experimental DBMM rules. DBM - The Egyptians vs Persians. Darius cops an arrow and Persians run away. Moderns - 1999 Americans fired lots of missiles at the Germans. DBR - Germans vs Algerians. Germans not worried by missiles in this one. WWII - Russians vs Germans; a game using the Blitzkrieg Commander rules. Thanks to the Tauranga club for running an excellent convention and for giving us lots of medals and prizes. Andrew's Han Chinese army took him to second place in the 25mm Ancients competition, and Brett's Medieval Germans (pictured below) came in fourth. Kendall won the Best Baggage prize for his 15mm Samurai camp, and although he is too modest to tell you, he also won the Best Sport prize. Rob won third prize in Warhammer using Orcs and Goblins. In the DBR competition second place went to Philip, and Danny who played for only one day of the two-day tournament was still third! Congratulations also to the City Guard club. They will be hosting Nicon next year here in Auckland. Below are a couple of pictures from the Tauranga convention. Medieval German pikemen advancing past some Egyptians. Natcon 2004 saw a great weekend, and a huge turnout from North Shore and associates. Best result was Gerard with 2nd in Moderns, Brett Best Painted DBM, Paul 3rd in DBM 15mm, Glen 3rd in DBM 25mm, Nick 4th in WHFB, Kit 5th in Early War FOW, Rob 6th in Mid War FOW, John, Brett, Alastair, Phil and Stuart occupying mid tables in their DBM comps, and Kyle also turning out in WHFB. So we had 13 club members or very close affiliates down there, great turnout by the North Shore club. Brett's Medieval Germans took on Andrews Chin Chinese in 25mm DBM, Brett winning that one. 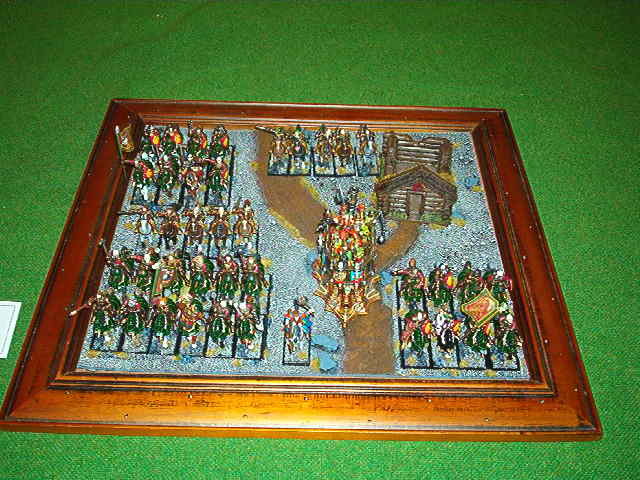 Bruce (2000 US Armoured Cav) and Gerard (1998 Brits) played 1/300th Moderns (result not posted). In 19th Century Principles of War Philip (Austrians) took on Kendall (Prussians) with the Prussian Cavalry capturing the Austrians supply line and rampaging behind the lines. Meanwhile Lee and Steve had a couple of games of Flames Of War and Lee's Late War Soviet Armour won one and Steve's Late War Fallschirmjager won one.